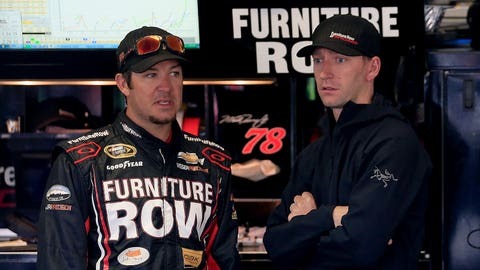 Driver Martin Truex Jr. (left) and crew chief Cole Pearn of Furniture Row Racing talk before a race earlier this season. Cole Pearn, the crew chief for Martin Truex Jr., admits he didn’t expect to be placed on probation this week after NASCAR forced his driver to drop to the rear of the field for last Sunday’s Chase-elimination race at Dover. Truex, who initially cleared pre-race inspection, had to go back through the inspection line when a NASCAR official noticed the right rear quarter panel on his No. 78 Chevrolet was flared out just prior to the race beginning. Despite having to start last, Truex finished 11th — good enough to move on to the Contender Round of the Chase for the Sprint Cup — but that wasn’t the end of it. On Wednesday, the sanctioning body put Pearn on probation through the end of the year and hit the Furniture Row team with a P2-level penalty for the flared side skirts — which give a car an aerodynamic advantage by increasing downforce. Was Pearn surprised that NASCAR decided to put him on probation and hand out a formal penalty to the No. 78 team after already forcing Truex to start in the back at Dover? 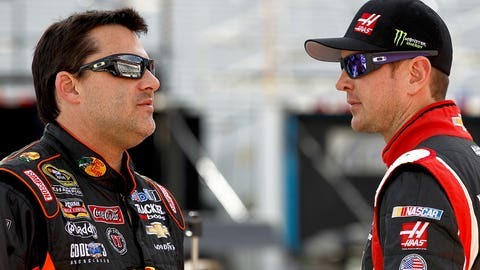 "Yeah, a little bit, honestly, but when they went back and looked they felt there was some precedent, I guess, to do that," the first-year crew chief told FOXSports.com on Thursday in the Charlotte Motor Speedway garage. "That’s definitely in their wheelhouse to know what that needs to be. But, I mean, yeah, I was a little surprised, yeah." The practice of flaring side skirts, of course, is nothing new. It was quite common — though somewhat frowned upon by NASCAR — last season, particularly as teams sought to gain every advantage possible during the Chase. NASCAR decided during the off-season to ban the practice, and promised penalties for those who didn’t comply. Last Sunday’s situation with the No. 78 car wasn’t the first time NASCAR has found a team in violation of the rule prohibiting side-skirt tampering. Back in May, NASCAR issued a written warning to Jimmie Johnson’s No. 48 team after the side skirts on Johnson’s car were allegedly flared out during a pit stop in the Sprint All-Star Race. Unlike Truex’s team, Johnson’s team was not penalized, however. Does Pearn understand why NASCAR decided to tack his probation and a P2 penalty onto the initial punishment of making Truex start shotgun on the field? "I think it was just them going back and trying to find similar times in history where they feel like something (similar) had happened," he said. "I think that’s what they based their decision on." While Truex said after Sunday’s race that he believed NASCAR was trying to "make an example" of the No. 78 team, his crew chief doesn’t see it quite that way. Or at least he’s not willing to admit it. "I wouldn’t go that far," Pearn said. "I’m definitely not going to say that." As for the whether the penalty and probation were completely fair, Pearn demurred. "I’m still not totally sure what transpired," he said. "It’s what they decided to do. It’s not really … it’s kind of all over and done with, really, so we’re just ready to go on and move on to this week." With the Denver, Colorado-based Furniture Row team being the only major Sprint Cup Series organization not based out of the greater Charlotte, N.C. corridor, Pearn always looks forward to the Charlotte races. 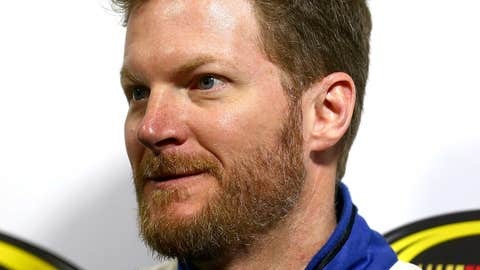 He has high hopes for Saturday night’s Bank of America 500. "I always like coming here," he said. "It’s one of my favorite racetracks, and I think once it’s all lit up and stuff like that on Saturday night it’s a pretty cool place to watch a race. Hopefully, the Furniture Row Chevy’s good and we can have a good night."